Did you know that it is common for electricity prices to increase with increasing temperatures? Power markets globally are suffering due to this state of affairs. Homesteads switch on their air conditioners to fight off the heat. Unfortunately, gas turbines are at their worst performance at high temperatures. On a significantly hot day, a turbine can lose as much as 40 % of its performance. This relationship is demonstrated in Fig. 1. This is no longer a reason to worry for power plants: Modern power augmentation systems can give the gas turbine a new lease of life as demonstrated by the study Assessment of Power Augmentation from Gas Turbine Power Plants Using Different Inlet Air Cooling Systems and many others. 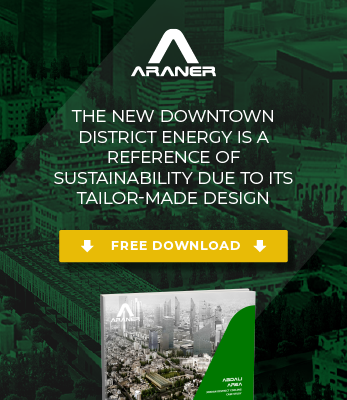 ARANER is at the forefront actualizing turbine efficiency projects to the global market. Commercially available technologies for TIAC include evaporative cooling and chillers. Each of these methods has fundamental advantages and disadvantages, as you will see next. While evaporative cooling technologies depend hugely on ambient conditions, chillers operate in ac-like settings. For this system, it does not matter whether the weather is humid or hot; the gas turbine gets a constant flow of chilled air. In addition, there is not risk of water entering on the gas turbine compressor. A chiller can reduce inlet air to as low as 42°F. Studies show that it can go lower than this, but the risk of ice formation in the compressor blades makes it inadvisable. Chillers can either be vapor absorption or vapor compression. For the former, the driving force is thermal energy usually from hot water or waste steam. Vapor compression chillers use mechanical energy, mostly from electric motor. This technology is probably the most natural cooling process. It looks complicated when the discussion diverts to TIAC technical terms-relative humidity, dry bulb temperature, wet bulb temperature and ambient conditions. The technology is available as wetted rigid media, fogging and wet compression. This is a series of corrugated media that is located downstream of air filters. Demineralized water flows down from the top of the media. As it flows, it wets a large section of media. This in turn reduces the temperature and density of inlet air thereby increasing performance. This method is applicable even in moderate climates with moderate increase in turbine power. It is similar to evaporative cooling; only that it uses high-pressure pumps to vaporize the water. It involves the simple concept of the cooling effect of direct evaporation. A combination of atomizing nozzles and high-pressure pumps creates fog, which then cools air as it evaporates at the inlet duct of the turbine. Alongside the PLC based control system and pressure pump, the fog nozzles play a very important role. Each of the nozzles produces billions of water droplets/sec to create a powerful fog. Power augmentation is also possible through injection of water droplets into the compressor. The reason why the combustion turbine capacity increases is because the air mass flow rate increase. In this case, not all the water evaporates; some of it enters the compressor. However, thanks to this characteristic, wet compression is more effective than other evaporative cooling technologies. What power augmentation system is the better option? When considering which power augmentation system to use, it is important to determine facility economics, budget constraints, climatic conditions and expected power output. The condition of the power plant also matters. There is no simple route out of this question; sometimes, even combining the two systems is viable. Looking at costs, geography and reliability, this is how the systems relate. It is obvious that evaporative cooling is the more affordable option when at the installation stage. However, remember that for a power augmentation project, one needs to look at the costs in a broader sense. Will the power plant produce power reliably in tandem with the changing electricity costs? TIAC with chillers scores very highly when you consider the long-term aspect of the plant. Evaporative cooling may be attractive if there is a water source in the vicinity, but the weather has to be friendly. Overall, the method is good in low humidity environments. In countries like Saudi Arabia, Jordan, Iran and other arid areas, where water is scanty, chillers are preferable. They can maintain a greater inlet air temperature drop throughout the year or as desired by the facility manager along the whole year and independently on the weather conditions. Complete weather-dependence is the biggest undoing of evaporative cooling. When the weather is humid or extremely hot, the system is unable to operate optimally. For TIAC with chillers, there is nothing like below par performance related to weather. ARANER has been installing these systems and helping clients achieve consistent turbine output for more than two decades. Ultimately, the plant designer determines the optimal solution for the plant in terms of ambient conditions criteria and the desired air temperatures. Such determinations take into account both plant performance and long-term weather data. This is why at ARANER we accompany our clients with comprehensive solutions, which go from the design of the plant after studying its objectives and environment; to the manufacturing of the plant components; and the installation and performance evaluation. Do you have any more questions about what power augmentation technology is best for you? Do not hesitate to contact ARANER.